Seven decades ago, the world got its first glance at film shot by the Allies in the Nazi concentration camps. An exhibit about how that footage was gathered will open this month at the History Museum of Mobile. Hollywood directors John Ford, George Stevens, and Samuel Fuller are known for American cinema classics like “The Grapes of Wrath,” “Shane” and “The Big Red One.” But their most important contribution to history was their work in the U.S. Armed Forces and Secret Services, filming the realities of war and the liberation of Nazi concentration camps. Few knew of that contribution, and how their confrontation with Nazi atrocities affected them for the rest of their lives. Their documentation provides an essential visual record of World War II. “Filming the Camps” presents rare footage of the liberation of Dachau with detailed directors’ notes, narratives describing burials at Falkenau, and the documentary produced as evidence at the Nuremberg trials, among other historic material. The exhibition, curated by historian and film director Christian Delage, was designed, created, and circulated by the Mémorial de la Shoah in Paris, and made possible through the support of the SNCF. The Field Photographic Branch was created in the 1930s to train cameramen “in case of emergency.” Films supervised by Ford included footage from Pearl Harbor and the Battle of Midway. 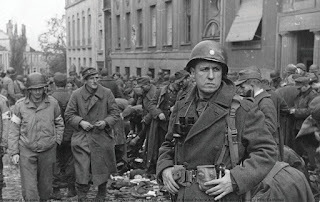 In 1943, Stevens joined a team under General Eisenhower, the Special Coverage Unit, which filmed the Normandy landings. They were given specific instructions to document “evidence of war crimes and atrocities” and would later enter and document the Dachau concentration camp. 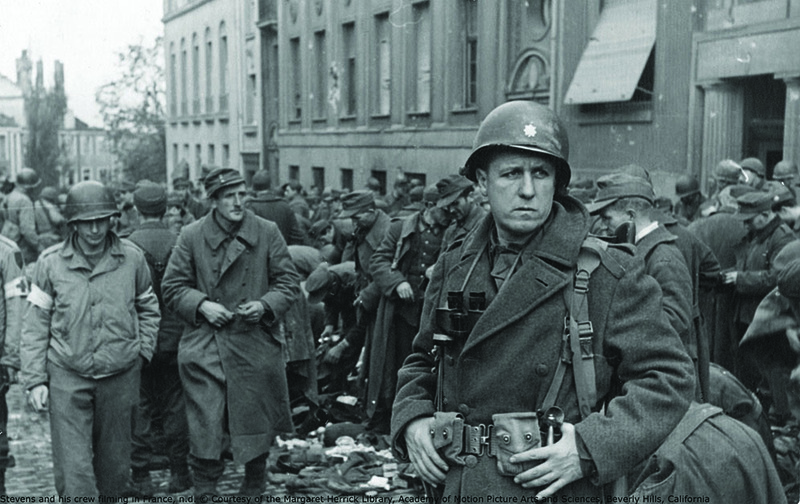 Their film documentation of World War II and concentration camp liberation was utilized as evidence during the Nuremberg trials — the first time movies were used in such a fashion. They served as inspiration for Hollywood cinema as well. The exhibit’s artifacts include rare film footage, interviews, manuscripts, photographs, director’s notes, and additional video of World War II. Last year, the exhibit was at the Atlanta History Center. The History Museum of Mobile will open the exhibit on Aug. 29, and then host a series of accompanying events until the exhibit closes on Jan. 16. The exhibit’s documentary will be screened on Sept. 24 at 7 p.m., followed by a question and answer session with Delage. That day, there will be a workshop for Holocaust educators from 8:30 a.m. to 4 p.m.
On Sept. 7, there will be a War and Memory conference, “The Holocaust in Memory and History” at the University of South Alabama. Scholar presentations and roundtables will be at Seaman’s Bethel from 9 a.m. to 3:30 p.m., and at 7 p.m. there will be a keynote lecture by Brad Prager at the Faculty Club. On Sept. 26, “Memory of the Camps” will be screened at 7 p.m. at the University of South Alabama’s Marx Library auditorium. Dan Puckett of the Alabama Holocaust Commission and author of “In the Shadow of Hitler: Alabama Jews, the Second World War and the Holocaust,” will give a presentation on “Alabama and the Holocaust” on Oct. 18 at 7 p.m. at Spring Hill College. On Oct. 20, Roger Grunwald, the child of survivors, will present his one-person drama “The Mitzvah Project” at 7 p.m. at Spring Hill College’s Mitchell Theater. A film series will start on Oct. 23, with screenings at Spring Hill College LeBlanc at 2 p.m. “Imaginary Witness” will be screened on Oct. 23, with “Night and Fog” on Nov. 13 and “Son of Saul” on Dec. 4, in collaboration with the Mobile Jewish Film Festival. On Oct. 24, Matt Rozell will present “Photographs from a Train Near Magdeburg” at the University of Mobile’s Ram Hall, at 11 a.m.
David Meola will present “Reflections on a Concentration Camp: Encountering Bergen-Belsen” on Oct. 25 at 6:30 p.m., at Mobile Public Library. Paul Bartrop will speak on “The British Dimension: Filming the Liberation of Bergen-Belsen in April 1945,” at the University of South Alabama’s Marx Library auditorium, on Nov. 15 at 7 p.m.
First Baptist Church of Mobile will host “Conversations on Holocaust Liberation and Rescue” on Nov. 17 at 6 p.m., and Ahavas Chesed will host “Memories of Agnes Tennenbaum,” a Holocaust survivor who died in Mobile on May 30, on Dec. 8 at 7 p.m. The museum, at 111 Royal Street, is open Monday to Saturday from 9 a.m. to 5 p.m. and Sunday from 1 to 5 p.m. Admission is $10 for adults, $7.50 for ages 13 to 17, $5 for ages 6 to 12 and free for ages 5 and under.